Slightly over a year has passed since the birth of this idea, Cancer Blows. An idea that has turned into a project, and a project that I’m proud to say could potentially become a foundation for such a wonderful cause. This disease hits everyone at one point in their life. Whether it’s directly or indirectly, it never fails to leave its mark. My mother was diagnosed with breast cancer in the final stretch of my high school career – fought, and won. Shortly after, my aunt lost her courageous and extensive battle with ovarian cancer in 2006. It all seems to pile on at once. Whether it’s coincidence or God’s divine plan, these struggles are not only tolling, but serve as a test to not only stay sane, but somehow find the positive in the situation. After losing a great friend and father, Ian Steczo did just that. Some individuals deal with stress by exercising, working, joining clubs, or maybe just eating a lot…which is never good. Ian has this great ability to generate ideas. From clever t-shirt slogans to organizing local fundraising events featuring popular recording artists, he does everything. He wanted to speak his mind while helping out the countless number of people in the same boat that he was in. So he calls me up and says “Dude, I want you to help me make a t-shirt about what I’ve been thinking lately….Cancer Blows”. The idea started out on a small scale in which friends and family would be able to purchase a shirt, and the proceeds would be donated to American Cancer Society. I was more than happy to join in. Ian and I have known each other since kindergarten, and began our soccer careers together not long after. GO SHARKS! His father, “Big Lar”, was our coach. He kicked our asses, but made sure our team was undefeated at the end of the year. I still remember him sprinting up and down the sideline, shirtless, screaming “Get it Dawg!” That first year, he tagged me with the nickname “Downtown Chris Brown”. The name still sticks today, and sort of has a ring to it, right? Larry was an awesome guy and quite the character. When it came down to designing the shirt, we decided to make Larry just that. “Lil’ Larry” is featured on the original shirt blowing a bubble with the phrase “Cancer Blows”. The shirts were made and we were so thankful for the support from family and friends that wanted to help the cause. And then they kept selling…and selling…and we had to order more…and more. The reaction to the shirts was extraordinary and better than we would’ve ever projected. It’s an inspiring event when you see half of the attendees at a Relay for Life event sporting the threads you helped create. Last summer, Ian and I went up to a friend’s lake house with several others to relax one weekend. At the end of the day once the boats were docked, the grills were starting, and everyone had changed out of their beachwear, we both realized that we were of the few that weren’t wearing Cancer Blows shirts in a group of 20. Pretty awesome. The compelling response this one idea has received has inspired our creative juices. It has driven us to think big and make Ian’s idea available to everyone. I am fortunate to work with an awesome group of guys, Pearachute Media, who will help make this happen. We will make these shirts, as well as future designs, available to people worldwide, and give them a chance to speak their mind while giving back to a great cause. Our hopes are high in expanding and making Cancer Blows a real business with more volume, more ideas, more people, and increased donations to cancer research. At pearachute media, we are always looking for ways to give back, especially when we can have a positive effect on our own community. We feel that is important to take the time out of our busy days to lend a hand. We love meeting new people, starting new friendships, and being able to help someone smile. Ian Steczo, the founder of Cancer Blows, has been a close friend to many of us in pearachute media. He grew up with my wife, Rebecca Weilbaker, and our designer, Chris Brown. Ian lost his close friend, Nick Calendo, in August of 2009, and only four months later in January of 2010, Ian lost his father to lung cancer. From this, Ian’s inspiration to start the apparel line was born. Since March of 2010, Ian and his family have sold over 500 t-shirts, allowing them to donate money to the American Cancer Society. We all know someone that has been affected by cancer, but it is not something everyone likes to talk about. Ian’s idea has always been to take a lighthearted approach in order to get people talking, and so far its working. So here we are, 10 months after the first shirt was printed, looking for new ways to help Ian and Cancer Blows. We are very excited to be working on the Cancer Blows website, which will be a way to reach even more people. One of our goals is to create a place where people can share their stories. 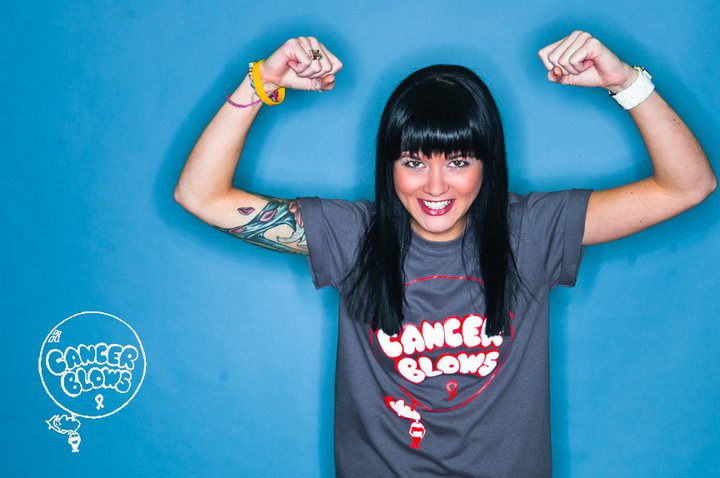 We also want them to share pictures of themselves, friends, and families wearing the Cancer Blows shirts. What does any apparel website need? Amazing photos of the shirts on people. We decided early on that we wanted our photos to be different, to have the lighthearted and fun feel that Cancer Blows stands for. So we needed help… and we got it from another local business. Stephan Alan Salon, jumped at the opportunity to help give back for a great cause. We were lucky enough to work with Heather, Kalrissa, and Brynn. They did an amazing job with the hair and makeup, helping us take our photos to the next level. We were also lucky enough to have some pretty great friends that wanted to be our models. We ended up with shooting Alanna, Melanie, Demetra, Rebecca, Mike, Chris, Tito, Steve, and Josh in about five hours on Sunday, January 9th at Stephan Alan Salon. It is an amazing feeling knowing so many wonderful people.